Inventory We are a resale marketplace, not a box office or venue. Ticket prices may exceed face value. This site is not owned by Caesars Palace Colosseum . The Colosseum at Caesars Palace is a 4,082-seat entertainment venue in Paradise, Nevada, United States. 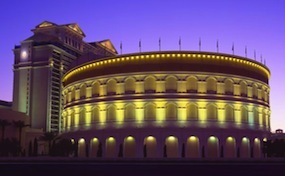 It is part of the Caesars Palace casino complex on the Las Vegas Strip and was constructed by Park Place Entertainment. The arena opened to the public in 2003. It was originally built for Celine Dion's show A New Day... at a cost of $95 million; the venue has also hosted performances by numerous other artists. The design for the arena was based on the ancient Colosseum in Rome. It is connected to the casino near the Forum Shops and is 256 ft in diameter, with the rotunda 120 ft above the floor. The stage measures 22,450 sq ft and has a proscenium arch with a height of 44 ft and a width of 120 ft. It was designed with 180,000 watts of amplification and 139 speakers. It also has a high-definition LED screen which cost $6 million at the time of construction. Because Dion stated she wanted an intimate setting, the arena was built in the round with no seat more than 120 feet from the stage. The Colosseum venue also included a state of the art humidity control system. This $2 million dollar installation helped provide the perfect air atmosphere around the performers on stage for optimal acoustics, performance, and conditioning. The venue also includes state of the art technology. Some of these state of the art technology include, the lighting board and the sound board. Backstage, rigging platforms and bars are completely motorized for optimal precision and placement. PalaceColosseum.com is not affiliated with any primary box office or supplier. We are a privately owned and operated business specializing in sales in the secondary market. To buy tickets for any Caesars Palace Colosseum events in Las Vegas simply click on the event of interest or call our operators at anytime.